Anyone believe in cataclysmic coincidence? Not me. 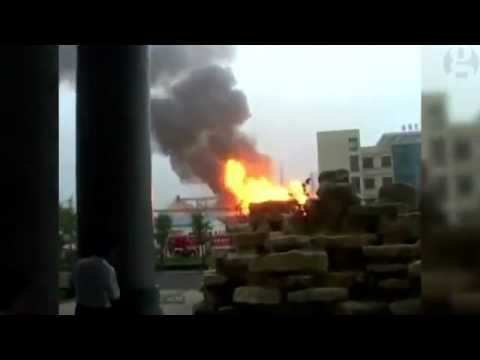 Chinese officials have reported another blast at another chemical plant in China. It’s the second in 10 days, this time in the Shandong province. No deaths reported yet, but nine have been injured. It’s beginning to look a lot like terrorism or some sort of set up. Last week, the Chinese blamed America for the first blast, saying it was over economic turmoil. This was another massive fiery explosion, followed by big plumes of billowing smoke. Over 150 firefighters are battling the flames. It will be interesting to see what the Chinese government says over the next few days. What do you want to bet they blame it on us again? 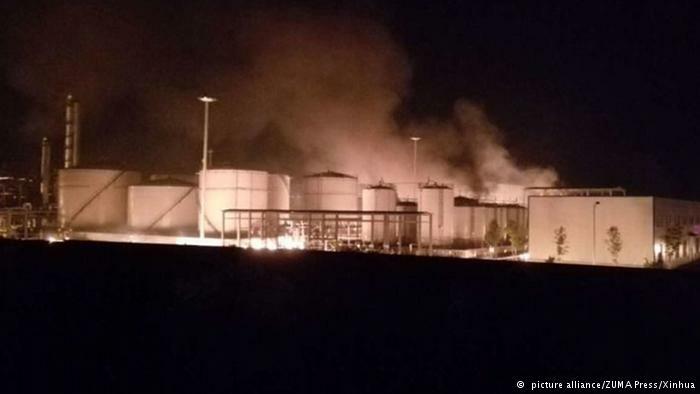 Chinese officials reported a blast at a chemical plant in eastern China on Saturday, triggering a fire and leaving at least nine injured. 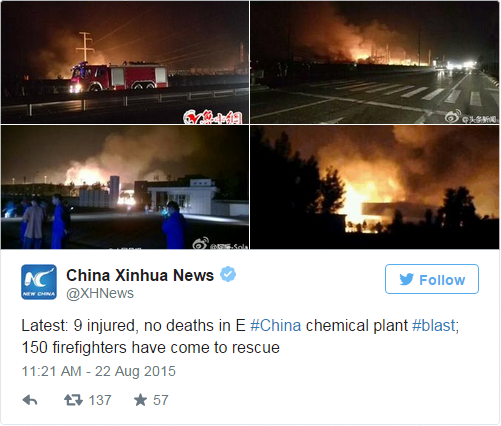 The explosion occurred at a chemical facility in Shandong province, according to China’s official Xinhua news agency. The blast has not resulted in any deaths, the news agency reported. Big plumes of smoke and a raging fire could be seen in photographs posted by the government, which said that 150 firefighters were battling the blaze. The incident comes on the heels of a deadly Aug. 12 explosion at a chemical warehouse in China’s Tianjin port, which killed at least 121 people and left scores exposed dangerous chemicals. The death toll includes 67 firefighters and seven policemen, authorities said at a press conference on Saturday, Xinhua reported. 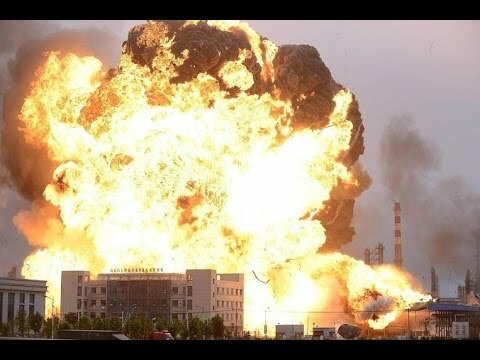 That explosion ranks as one of China’s worst industrial accidents in recent years. Chinese workers in protective suits have been clearing wreckage at the Tianjin site, including charred car bodies and crumpled shipping containers. Authorities said on Saturday that 640 people remain hospitalized, including 48 who are critically injured. Another 30,000 people in and around the area have had their lives turned upside down by the disaster. This blast follows one 10 days ago that felt like a nuclear blast when it hit. I watched the videos and they were thunderous. That blast killed at least 121 people, of which 67 were firefighters and 7 were policemen. Since the Chinese are not typically transparent with information and news, I can’t help but wonder if those numbers aren’t much, much higher. China has a radical Islam problem and it would not surprise me if this was the work of Jihadists. Another blast or two like this and the whole country will get locked down. The communists don’t have any sense of humor when it comes to terrorism. This happened at about 8:50 p.m. Saturday, China time. 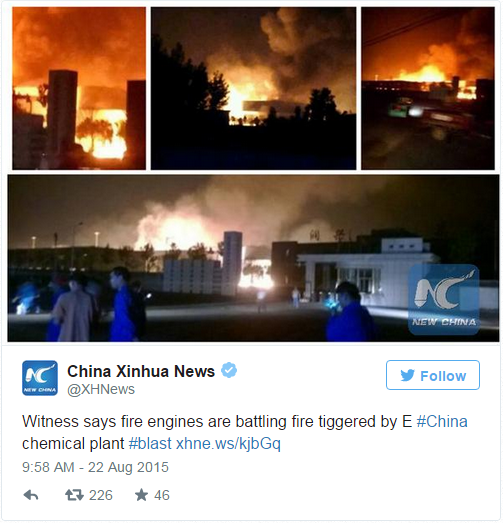 China Daily is reporting the chemical plant is located in Huantai County, less than 1 km from a residential area. State media reported that the force of the blast was so strong that it shattered windows nearby and could be felt as far as 2 km away. My bet is terrorism and this bears watching.